Aaron Feldman has been the founding entrepreneurial and visionary force behind Sunroad Enterprises since relocating to San Diego from Mexico with his family in 1977. After earning his degree in business from the University Autonoma de Mexico and Universidad Anáhauc, and continuing his Master’s education in France and Italy, Aaron Feldman began his professional career in Mexico with Celanese and Chrysler Corporations. He taught business courses at two of the most prestigious universities in Mexico for eight years, simultaneously assuming leadership of his family’s steel manufacturing and real estate businesses. 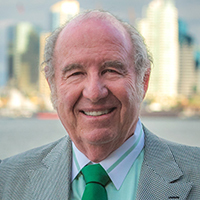 Since settling in San Diego, Mr. Feldman established, developed and led Sunroad Enterprises to significant growth and success in the real estate, automotive and financial arenas. Aaron Feldman is an active member of the Chief Executives Organization (CEO) and the World Presidents Organization (WPO), and a past member of the University of California and San Diego’s Chancellor’s Associates and the Institute of Americas. He serves on the International Advisory Board of the University’s Center for US-Mexico Studies and the Graduate School for Intl. Relations and Pacific Studies (IR/PS). Mr. Feldman provided the lead gift for the IR/PS’s ‘Partnership with Mexico’ project. He was also a founding force behind the creation and establishment of the San Diego Jewish Academy. Other civic and charitable activities include the sponsorship of a Fire and Rescue Helicopter for the City of San Diego, Memorial Sloan-Kettering’s pediatric sarcoma research program, City of Hope Cancer Center, Challenged Athletes Foundation, Children’s Hospital Auxiliary, Public Service Scholarship Fund, Sunroad Community Foundation, Jewish Family Services, the Anti-Defamation League, Scripps Foundation, San Diego Sports Medicine Foundation, Chabad of San Diego, and numerous other charitable, educational, civic and cultural institutions. In 1994, Aaron Feldman was honored to receive the Juvenile Diabetes Foundation’s ‘Father of the Year’ Award, and in 2007 Mr. Feldman was selected by the San Diego Fire Chiefs’ Association as the recipient of its ‘Person of the Year’ Award, in recognition of his contributions to improving Fire-Rescue air capabilities.